Shree-Lipi 7.4 software contains various packages. 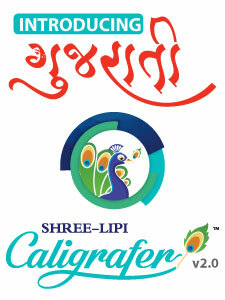 Shree-Lipi Soft and Shree-Lipi Pearl software are multilingual packages. There are language special packages, which give more stress on a particular script, while still supporting the other scripts. The main difference in these packages is number of fonts in each package. Avishkar Font Styler to make the fonts thin, fat, slanted etc. File Compatibility - facility to use documents of other window based packages in Patrika & vice versa in formats like MS Word (DOC), RTF, TEXT, ISCII, PCISCII, Shree-Lipi editor, HTML, iLeap etc. Find & Replace option for Indian languages. Define Keyboard Shortcuts for repetitive words to reduce re-typing of same text again & again. Insert date & time in Indian languages in 12 formats. Sorting: To sort Paragraph & Table Data as per Indian Language rules. Spellchecker On line spell checking facility for Indian languages. Mail Merge in Indian language. Text Styling using ROOPA: In-built Text Styler to give effects like Condensation, Expansion, Shadow, Forward / Reverse Slant, Rotation & Out Line to Text etc. E-mail facility in Indian languages. Transliteration Facilitates transliteration from one Indian language to another language. Typing & Menu language selection: User can select typing & menu language like Hindi, Marathi, Tamil, or Malayalam etc. About 200 font formats supported for all scripts together. Special Shree-Lipi Soft package supporting Indian language typing, conversion from one font format to another, transliteration of names data, fast printing on dot matrix printers. I found Shree-Lipi is the best langauge software. I use it since last five years. Thanks to Modular team. Shree-Lipi is very good and perfect software. I use shree lipi since 1995. It is very userfriendly. Thanx Shreelipi. Shree-Lipi is very nice & easy to use. It supports most common software and Autocad too. I thanks to you for this software. Excellent linguistic software, using since 1994. Shree lipi is wonderful and is working wonders to my copy. Great Software... been using since 1997 with the basic locks and still continuing using with the software with 3 usb locks. Fully satisfied with it. YouTube Channel to solve your queries. To download a file right click on language name and select option 'Save Link As..."
Above list is of font catalog, these are not fonts files for downloading. Subscribe our newsletter for attractive offers and product info. Copyright 2000-18 Modular Infotech Pvt. Ltd.